What did I just say about contests? Ah well, inspiration struck this time, so I've ended up entering the first round of the PatternReview Sewing Bee (along with 117 other sewists!). When I saw that the challenge was to make a cardigan, I knew I had to try, but it was only when I finally found the perfect fabric halfway through the week that I decided to go for it. When I first saw the challenge I wasn't sure I'd enter as I couldn't come up with a good concept. But when thinking about coral, and about the description of the colour at the Pantone website, the phrases "authentic, connection, intimacy" made me think of traditional Ukrainian korali, the multistrand coral necklaces often interspersed with silver beads or crosses worn by women in traditional costume. These necklaces were highly valued and every woman had one - the more strands the richer you were. 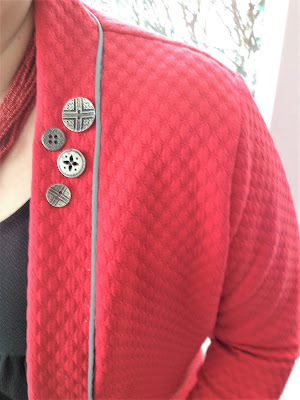 This use of coral felt like an authentic connection to my own family heritage, and so I wondered if I could make a cardigan in the redder tones of most korali, with silver accents. I was fortunate enough to find a reddish poly knit at my local Fabricland with an embossed surface; the colour and the texture both remind me of coral. I used silver reflective piping in the front band seam to give a touch of silver to the cardigan, and then I found some silver buttons with designs that look very much like the kinds of beads and crosses in these necklaces so made a little feature of them as well. 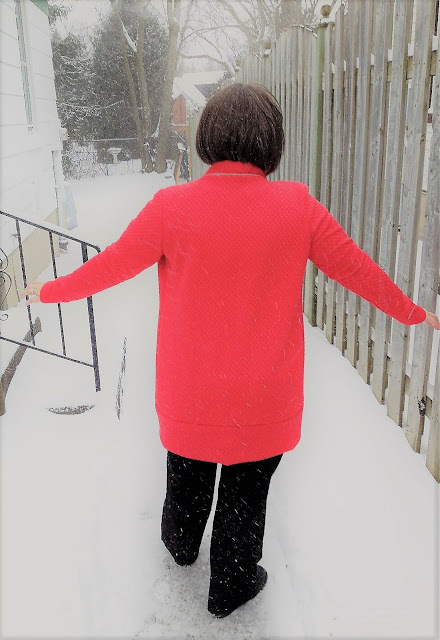 I feel like this is my Ukrainian style coral cardigan and am quite happy with the fit and the colour -- though not exactly Pantone 16-1546 it does give me a sense of connection and joyful pursuits as described in the colour write up! 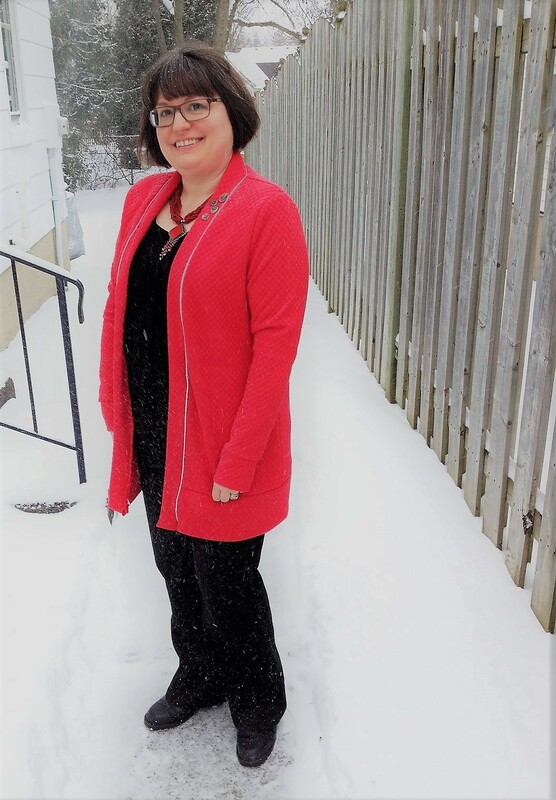 The pattern is the Blackwood Cardigan by Helen's Closet, a pattern that I had out and ready to trace anyhow -- because this contest challenge was something I was planning on making and know I will wear, I went ahead with a different colour and fabric than I'd intended for it first. I only want to enter in to contests or sewalongs that fit in with my already scheduled sewing, otherwise I find they kill my joy in sewing. So this one was fortuitous. The fit is pretty good, though the sleeves are quite narrow, not really great for layering over anything else that is in the least bulky. In my next go I may enlarge them slightly around the upper arm in particular. I used a different fabric than recommended; this one is a lot sturdier and much less drapey than the recommended knits. But I love the way it turned out -- it's like a cozy sweater cardi, perfect for the cold weather we're having currently. Though I don't really recommend standing outside in a snowstorm for very long only wearing this! It was rather blustery on Saturday but I had to get some pics to enter the contest so out we went. I'm wearing it with my own coral necklace I bought when I visited Kyiv about a decade ago. I think it pulls it all together quite nicely. 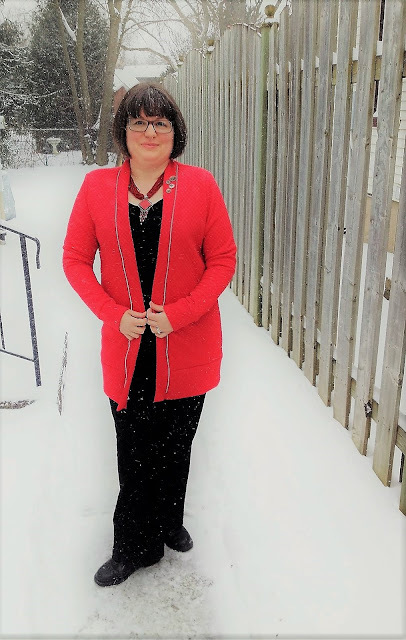 I do like the cardi, and I really like how I was able to take my vision of something that coral means in my life and turn it into this project. Warm, cheery, and personal. What more can we ask of our sewing? what a lovely way to enter the contest. Your necklace is beautiful. I love the story behind your make. It gives a whole other layer to the finished garment, satisfying so many of your personal criteria and thinking. I can see what you said about the sleeves, but as you mention, the original pattern was designed for fabric with 40% widthwise and 20% lengthwise stretch. Mind you, there are also many times you need a jacket over a short sleeve top! And what does it matter anyway, patterns are there as a beginning, we can change anything, intentions or construction, when we sew. Very good point Sara! This knit definitely has the bare minimum of stretch needed to make this. A lighter, stretchier knit might be just fine :) Also it fits well over a tight or short tshirt sleeve so there is that. Yes, I do find it enjoyable to have a story to go with a new project too! This shade is glorious! So cheery, especially on a snowy day! I had the same issue with my Jaime Cardigan. I made my sleeves a good couple of inches larger at the shoulder.